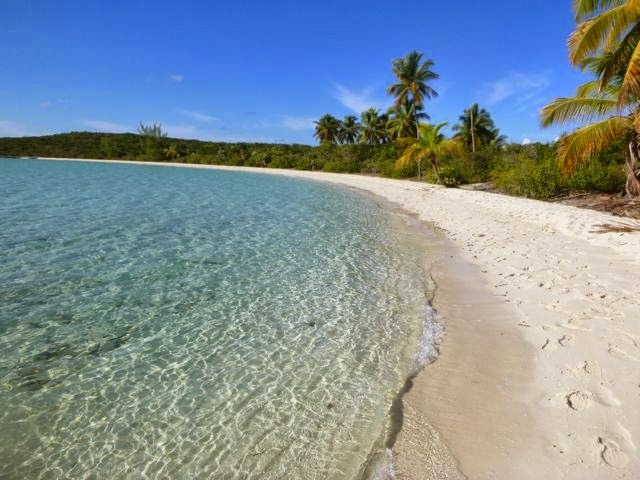 If paradise is azure water, a soft sand beach and gracefully arced waving palm trees, all the better for us parched Bohemians if that palm’s a coconut. Perhaps it’s no coincidence; whether planted or washed ashore and randomly rooted, coconuts abound throughout the much of the Caribbean. It was however, five years ago at a Hawaiian Farmer’s Market on the Big Island where we were first introduced to the ultimate source of natural tropical foo-foo umbrella drinks, sans alcohol, coconut “water.” There, a handsome, bare-chested and buff early-20-something man, stylishly lopped off the top of a large green coconut with a large machete and served it up, smiling with a straw. It was watery, slightly sweet, and, while it matched the balmy temperature, refreshing. Whether it was the server or the sip, there was a steady line-up of thirsty ladies. Interestingly, in the last few years, packaged coconut water’s gone the rage in the U.S. It’s still good, though it lacks the magic when taken out of context. 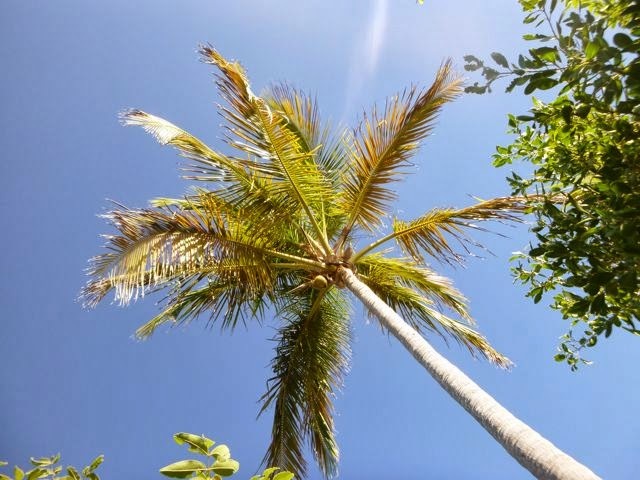 those coconuts are wayyyy up there! Coconuts 1: Seitz 0. But, attractive servers and showmanship aside, we didn’t relish hanging out to pay $2-5/coconut in a tourist zone to enjoy this natural beverage. Frugal and adventurous cruisers that we are, we wanted to bag and bust our own coconuts. Unlike conch and lobsters, there was no need to dive for them. Unlike mahi and other scaly delights, no rod, reel or filleting was required and they didn’t stink. their money. Coconuts 2: Seitz 0. Last year, we never quite got the hang of it. We didn’t have the grit to scale the height to get the nut, nor did we see any with a ladder, though we observed a makeshift one nailed onto a coconut in Saba. One rare occasion when we did have the good fortune to find one on the ground and still green enough, we were puzzled with how to get at it, without a machete or equivalent in tow. Maybe it was Michael of Goldilocks who clued us in…. Whoever it was, advised, cannily, “Use a drill!” That we could do. It wasn’t as pretty, but Wayne aka my handyman, was confident it would be effective. 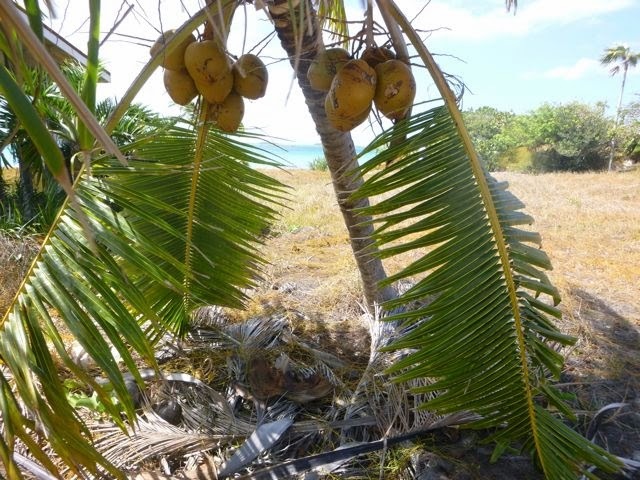 This year, the coconuts at Lee Stocking Island taunted us with their bounty, mockingly out of reach. They surrounded themselves with dense underbrush. When Wayne bushwhacked his way to them, they were still too high to reach. Phil takes a whack or two or three, too. Coconuts 3: Seitz 0. A few weeks later, wandering a different part of Lee Stocking with Wayne’s Dad and his wife Gunnel, we struck pay dirt. 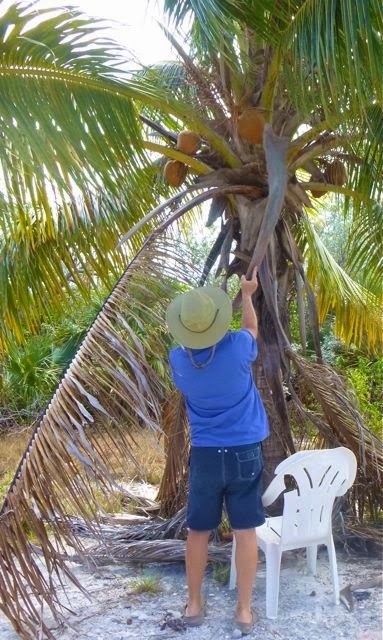 Initially, we found a loaded palm with a rickety chair below it. The coconuts weren’t in reach, but were tantalizingly close; still so after stepping in the chair. A stiffened palm branch was closer, but still not quite beefy enough to get the job done. 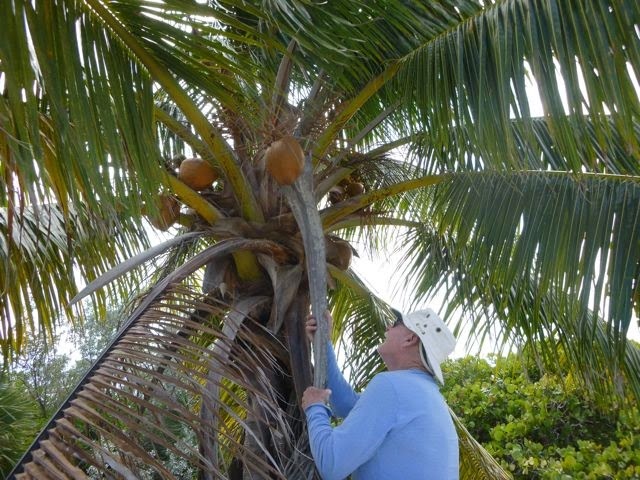 coconut water expert Wayne explains, “is a green coconut. 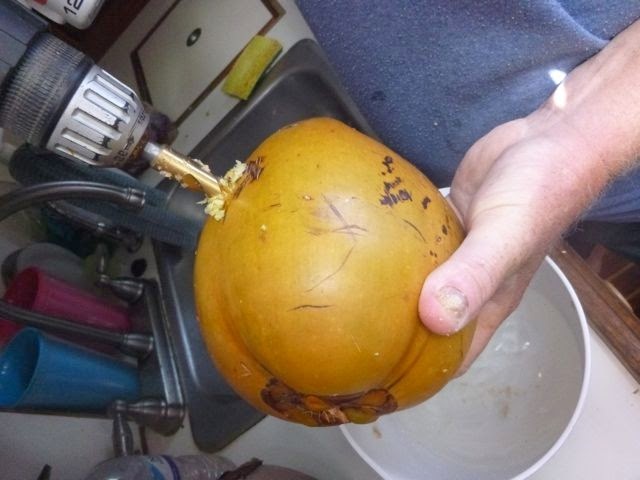 a brown, more mature coconut. Coconuts 4: Seitz 1. And then? 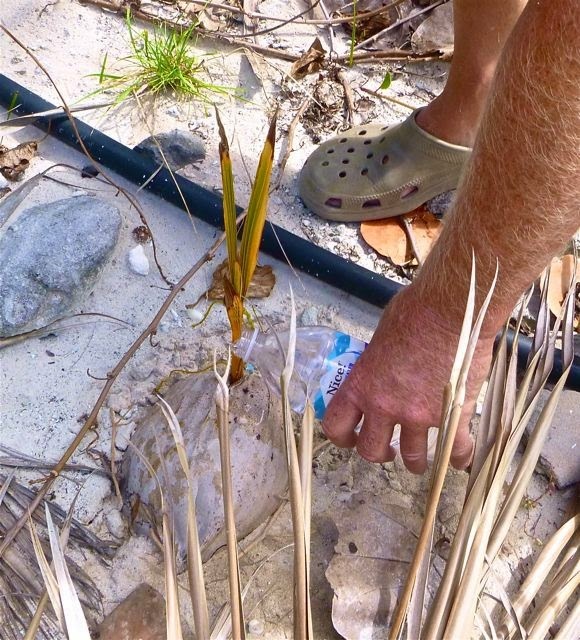 A little while later we found a short happy coconut palm. There was one green coconut on the ground, and several others in easy reach. We packed two green, and Wayne’s Dad nabbed a more mature but juicy one, as evidenced by a definite “slosh” upon shaking it. They were heavy and we were a ways away from our boat. 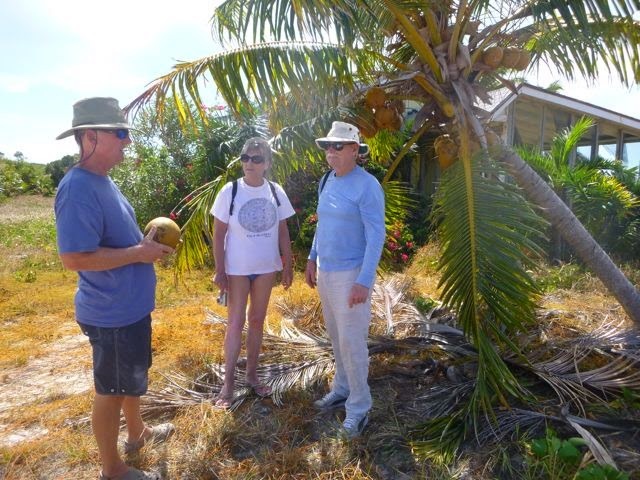 But who can resist slaking their tropical thirst with friendly equally adventuresome family visitors on a nabbed natural treasure? Not us! Drag (well, lug), drill and drain, then drink! Even without a bare-chested Hawaiian – or Bahamian -- (though Wayne’s getting more of what passes for bronze on his beautiful chest), it was good. We tried it with a little rum, also enjoyable, though I prefer each separately. Sure helps when they’re truly low hanging fruit like this. Unlike fine wine, however, the coconut water does not improve with age. 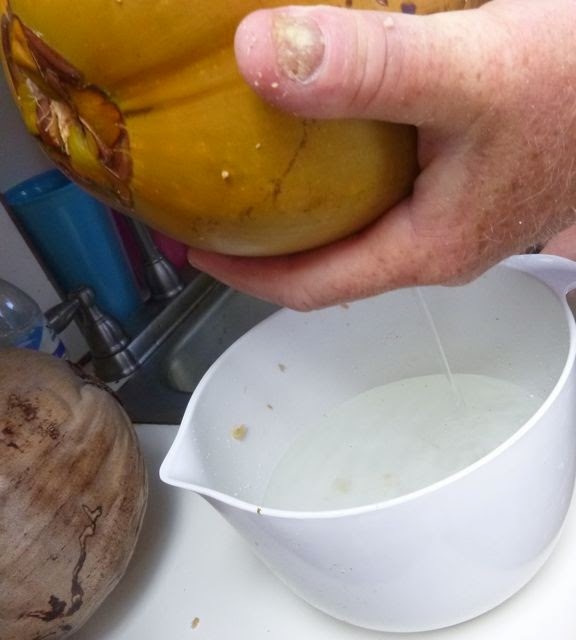 We rejected the mature coconut’s water, and when I mislaid some chilled coconut water in our fridge for a few days, it too, alas, was not drinkable. But now, we know how to get more... And I confess, Wayne did get to test-drive his drill technique the day before our first Lee Stocking Island stop. 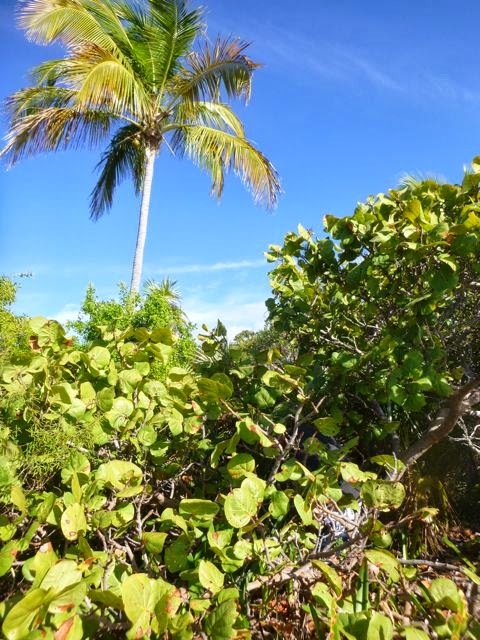 I found a green coconut on the ground at Rudder Cay, close enough to the high tide line to claim I wasn’t trespassing. planting it there. Coconuts 5: Seitz 1. In any case, let the hunt resume anew! modern technology; machetes or not. Retrospective: This was when we anchored at Stocking Island (N23.46.303 W73.06.362) -- twice. The first time was February 26, 2014. The second was March 15, 2014. At this time we are currently further South, in the Raggeds (N22.14.920 W75.45.106). and ultimately its water failed the taste test.